This simple and decadent dessert is sure to be a crowd-pleaser. In fact, at VeryVera catered parties, this was more popular than the shrimp! Some say the recipe comes from the can of sweetened condensed milk, and others say it was made popular when the recipe was published during the time the musical Hello, Dolly! was on Broadway. Also known as Seven Layer Bars, these sweet treats are so rich, you’ll want to cut them into small squares. When they come out of the oven, try resisting the urge to dive right in. They’re best when cooled and set! Preheat the oven to 325°F, and grease a half sheet pan (13 x 18 inches), with edges, with floured baking spray. Add the graham cracker crumbs to the melted butter and mix well by hand. Once the graham cracker crumbs are moistened by the butter, press the mixture into the bottom of the prepared pan. 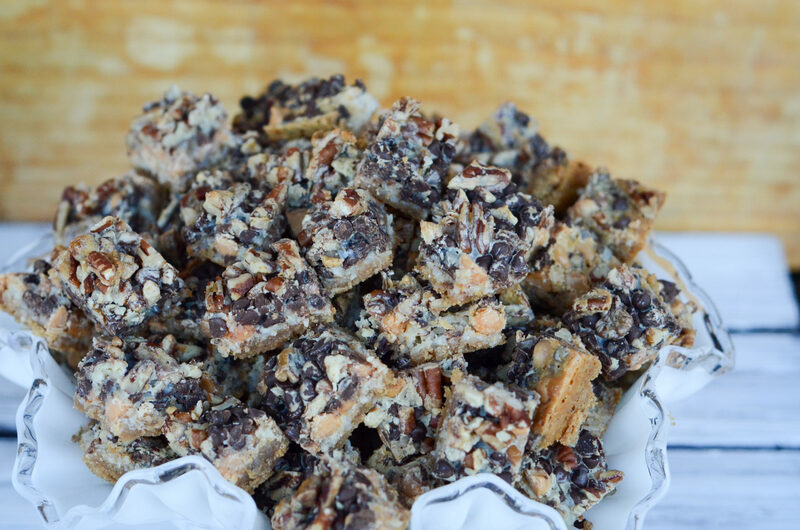 Layer the shredded coconut, butterscotch chips, chocolate chips, and pecans over the top. Pour the sweetened condensed milk over the entire pan. Do not mix. Cool completely before cutting into 1-inch squares.